EARN DOUBLE POINTS every time you purchase Aveda Invati™ Scalp Revitalizer! Offer valid NOW through July 31, 2013! A maximum of 1,200 points may be awarded. Limit 1 offer per member, per transaction. Not transferable. Not valid with any other Bonus or Double Points offer. Not a Pure Privilege Member yet? Ask a receptionist next time you stop in and begin rewarding yourself today! Stay on track with your New Year Resolutions! Already struggling to stick to your New Year’s fitness & diet resolutions? Massage can help! Massage has an amazing ability to help us feel better about ourselves (studies have shown that regular relaxation massage releases seretonin & endorphins- aka feel good chemicals), as well as reduce injury. When we reduce our stress levels & feel better we are more motivated to make better choices about diet and exercise. Massage also helps reduce injury by increasing circulation and improving body awareness- which improves the efficiency of how we use our bodies during everyday activities and exercise. Make massage apart of your New Years resolution to feel good today! ALSO, join us that evening from 3:00pm-7:00pm for our GIFTING EVENT! Travel through our experience centers and enjoy tasty holiday treats. There will be specials running that night and a raffle prize! 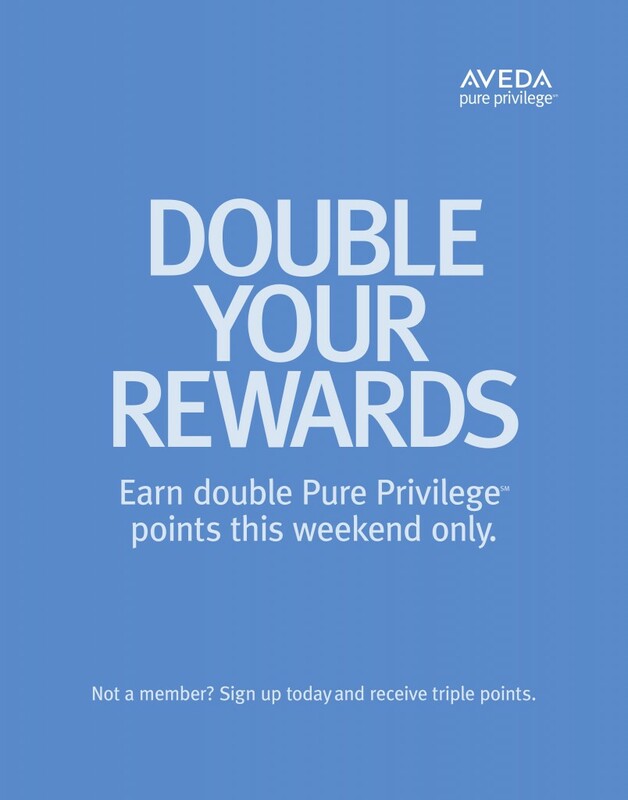 Today through this Sunday, December 2nd, 2012, is a national Double Points weekend for Pure Privilege members. Recieve 20 points for every dollar spent on Aveda retail purchases. This is a great opportunity to earn extra points on holiday gift packages and stocking stuffers for everyone on your holiday list! If you are not a Pure Privilege member yet, stop in and sign up at our front desk and start earning rewards today! 2008, 2009, 2010 2011, 2012 and 2015.